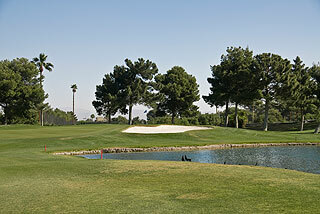 The Las Vegas National Golf Club is one of the few golf courses in the Las Vegas Valley with a rich history. 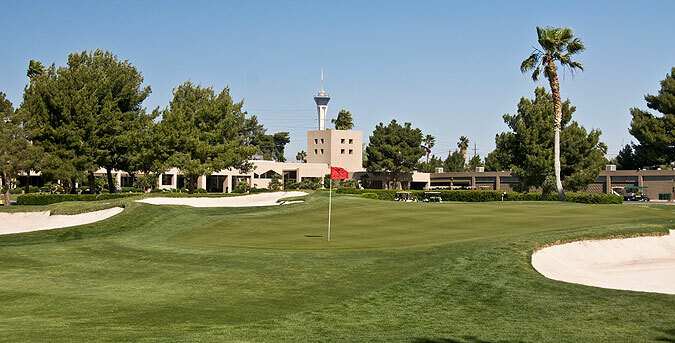 Formerly known as the Stardust, the Sahara, and the Hilton, LV National has played host to many PGA and amateur events in the past half century. 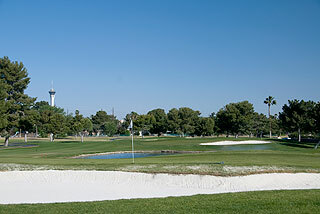 The Sahara Invitational was played there from 1959 - 1976, and the Las Vegas Invitational was hosted there on a rotational basis through 1996. Las Vegas National has become a landmark over the last 50 years. It was host to the movie "Casino", starring Robert DeNiro, Sharon Stone and Joe Pesci. The house used in the movie sits off to the left of the #1 Tee Box between the #1 and #18 fairways. During the 1960's, the Rat Pack frequently played golf then spent time in the bar. Locals tell great stories about late night matches under the glow of the driving range lights. Many nights would have Frank Sinatra, Dean Martin, Peter Lawford, Joey Bishop and Sammy Davis Jr. around the piano, entertaining their guests with songs and stories. We found the Las Vegas National to be in wonderful condition, with finely cut fairways and greens that were extremely consistent. Well-sculpted bunkers and tall palms often framed elevated green complexes, which were aesthetically beautiful and challenging to score on. The putting surfaces were soft, of medium size, with mild undulations and also of medium speed - due to the poa grass mixture. On property are three practice greens and a complete range with yardage markers. 150-yard stakes are planted in the middle of the fairway on most holes, and sprinkler heads are marked to the center of the greens. GPS is also standard on each cart. Appreciated were the abundance of rakes near all the traps - a courtesy often overlooked at many courses. Huge bunkers with 1 or two rakes seem to be more the norm these days, slowing play and discouraging golfers from doing the necessary work in the first place. The Clubhouse here is spacious, and includes a pro shop, full service lounge and short order dining area, and banquet/outing facilities. An outdoor terrace and grill, and a snack shop are also conveniently located near the turn. The rangers were extremely friendly and knowledgeable, and seemed happy with their jobs. The course itself is quite challenging. It is not overly long from the tips (6815) but water hazards on 10 holes, numerous doglegs, and 66 sand bunkers make the layout difficult, especially for mid (or white) tee players (6418 yards). The fairways are generally tree-lined, placing a premium on both accuracy and distance. This is especially true on the front nine, with 3 of the par fours playing at over 410 yards from the middle tees. Often, the approaches are to elevated greens with deep bunkers posing as bodyguards. The opening hole is a long and demanding par five. It is open off the tee, but requires accuracy on the second and third shots. The approach is uphill to a gorgeous green complex, with a pond to the right, and deep bunkers short on both sides of the green. The long par four second bends to the right with a tree-lined fairway making for a narrow approach. A pretty par three follows. It plays long to an elevated green complex and is quite tight. There is a creek running the length of the hole on the par 5 fourth. This is a tight driving hole that doglegs left at the 150 marker. Most golfers will need 3 accurate shots to reach here. Number five calls for a tee shot over a creek and a shot shape that bends to the right. Trees and fairway bunkers make this hole a challenge. The sixth is the number 1 handicap - a long dogleg left par four. The approach is open, but bunkers in front of and behind the green warrant considerable attention. A narrow tree-lined fairway will greet you off the seventh tee. Deep bunkers surround the green, but there is bail out room long right. The putting surface is sloped back to front on the long par 3 eighth, so be aware of the pin placement (which is indicated by color-coded flags). A pond short right encourages approaches from the left side. Bunkers line the right side of the fairway on the closing hole of the front. It plays open off the tee, but demands accuracy on the approach to avoid the bunkers short and long. The backside is noticeably shorter, although the 3 par threes beg to differ. They play 182, 230 and 222 from the tips. 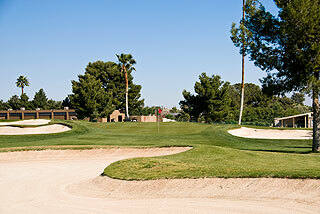 Number ten is wide open off the tee, with a deep greenside bunker on the left the main obstacle to a good score. The easiest of the par threes follows. 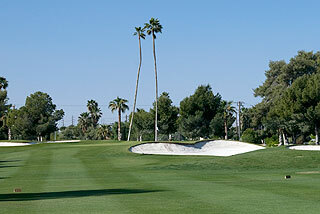 Take advantage here, as this is one of the best birdie opportunities on the course. Next up is the number two handicap. There is water right off the tee, and the approach plays uphill making the hole longer than advertised. Water right encourages a lay up off the tee on number 13. Aim just left and past the 150 for the best approach here. The 14th is a long and tight par three (218 from the mid tees) with bunkers short right and deep left. There is a bit of room on both sides, and the green is very putt-able. 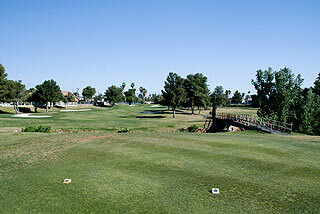 The 15th is a long dogleg left par five with a water hazard on the right side of the fairway. The approach narrows to a beautiful green complex, with well defined bunkers on both sides. The par three 16th plays over a creek to a tight, elevated green. Take enough club here as the putting surface is large and there is a little room long. Seventeen plays uphill all the way, with an intimidating green featuring a deep bunker front right and another one ready to engulf anything hit long. Water right and trees left make the finishing hole a challenge off the tee. It bends to the right, but cannot be cut off, as the hazard runs close to the green area on that side. An accurate lay up to the left side of the 150-yard stake will afford the cleanest approach here. Again, a deep bunker fronts the green, setting the stage for a high, soft approach. This is the signature shot of Las Vegas National, which you will have to successfully negotiate if you are going to score well. Get it over the bunker, but keep it on the green. The soft poa grass helps to hold the greens on these types of shots. 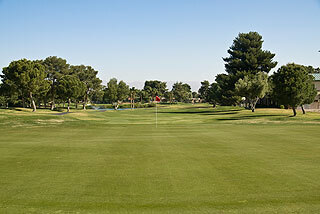 Las Vegas National is a traditional layout, providing a nice respite from the many desert courses in the area. 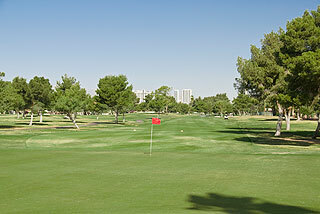 I love desert golf, but find parkland layouts in Vegas to be a refreshing break. Lots of green areas right and left... Avoid the trees and you can score well here. Keeping it on the fairway off the tee is almost as important here as it is on target layouts. The shots I attempted over and around trees reminded me of rounds in my hometown state of Michigan. The abundant and beautiful palms reminded me that I was not in Kansas anymore, however. We think most golfers will enjoy this course, for the sheer beauty and the challenge - and the convenient location just minutes from the strip. We certainly recommend it. 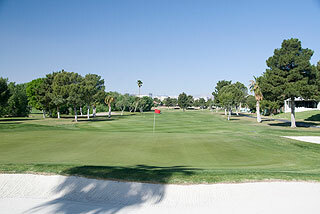 View the Two Guys Who Golf Detailed Listing Page for this course with a link to its website & current green fees click here.